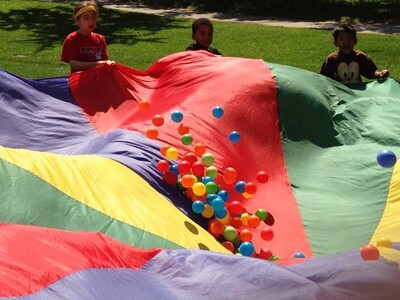 Through the multi-sport model kids develop a variety of Gross Motor, Athletic and Teambuilding Skills in a fun, creative, non-competitive environment. Our programs are ideally suited for both School Day Curriculum Enhancement and for Lunch Time and After-school Programs. We even have great Teacher Workshops on a variety of topics perfect for Professional Development. When you book Sportplay, you get a qualified, experienced coach, enough equipment for every child and a gym full of happy, active kids. 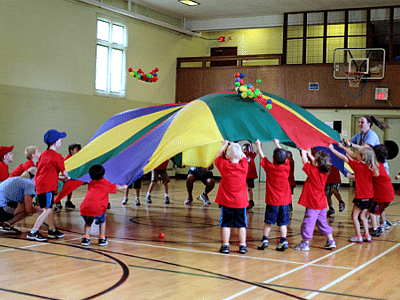 Sportplay specializes in engaging large groups of young children in physical education and recreational activities no matter what their interest level or experience. At Sportplay everyone plays, everyone learns, and everyone has fun! We do this through play-based programming, by making sure every child has access to the equipment and play time, offering creative games and a fostering a positive, supportive environment. 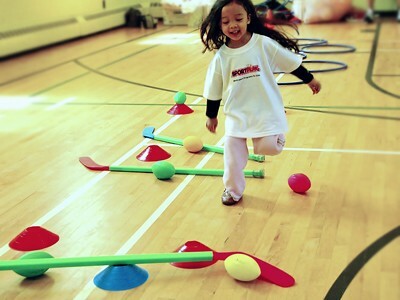 Sportplay offers a unique approach to physical education that excites, motivates and activates kids to participate in recreation and sport. We use fun, positivity and creativity to get kids playing. The School Day program offers instruction for 7 different sports. 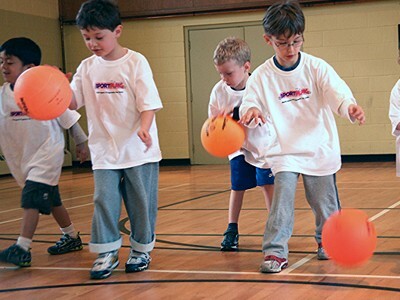 Kid’s learn the basic concepts, skills and rules for baseball, basketball, ball hockey, football, soccer, track and field and volleyball while developing a variety of gross motor, athletic and team building skills. Programs are designed to run 30 – 60 minutes.At Sportplay, everyone plays, everyone learns, and everyone has fun. The Lunch and After-school program offers 7 sports with a different sport featured each week. Kids will learn the basic concepts, skills and rules for baseball, basketball, ball hockey, football, soccer, track and field and volleyball while developing a variety of gross motor and athletic skills. The program runs for 1 hour. Our trained coaches provide all necessary equipment, supervision, and coaching (including lunch supervision for lunch time participants). Parents register their children through the Sportplay registration system so it’s easy for the school. We also offer a sport specific program for older grades with a one sport focus that combines skill development and game play. 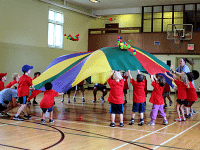 SPORTPLAY offers workshops for teachers on a variety of topics to maximize class participation, gross motor skill development, and teacher effectiveness. The Sportplay approach is positive, creative, non-competitive and play-based. Book us for professional development and conferences. We also take soccer Monday evenings at High Park and love the program and coach there too. 2) Sportplay was a great introduction to a variety of different sports, with a focus on developing some basic sport skills. The instructors made it fun and there were no winners or losers, just the pleasure of physical activity and the introduction of new skills. 3) Rather than me stick a 10 in every slot... I thought I would pass on some notes about Sportplay... For one the location was super convenient and the price was reasonable. I never heard my daughter Nicoletta complain once about her experience there. She loved going there and tells me so every day we drive by it. She is already looking forward to summer camp next year. She loved doing waterplay on the very hot days. She raved about Coach Dawn. Everyone was always very friendly upon arrival and it was pretty smooth registering and leaving the kids. The coaches seemed very competent and happy to teach the kids, which is so important. The facility was super clean which was also very important to me....that is why I kept her there for a month for full days. I also recommended it to her cousin and she signed on to for a couple of weeks and enjoyed it. Good Job to all...I would have no problem recommending Keep me in the loop with any new time slots and classes as my daughter is 4 in December and I have a son turning 2 in January who has a lot of energy that he needs to burn off. 4) So far, we have done the weekly sportplay session, sportplay camp and sportplay soccer. All have been excellent. The main reason are the coaches! They are great and do a wonderful job in engaging the children. We ha? ?ve had Coach Emily for all these three sessions and she is fantastic. She is great at trying to get my son to participate (particularly during his soccer session). She and all the other coaches are very patient and have such great, positive attitudes. Keep up the great work!